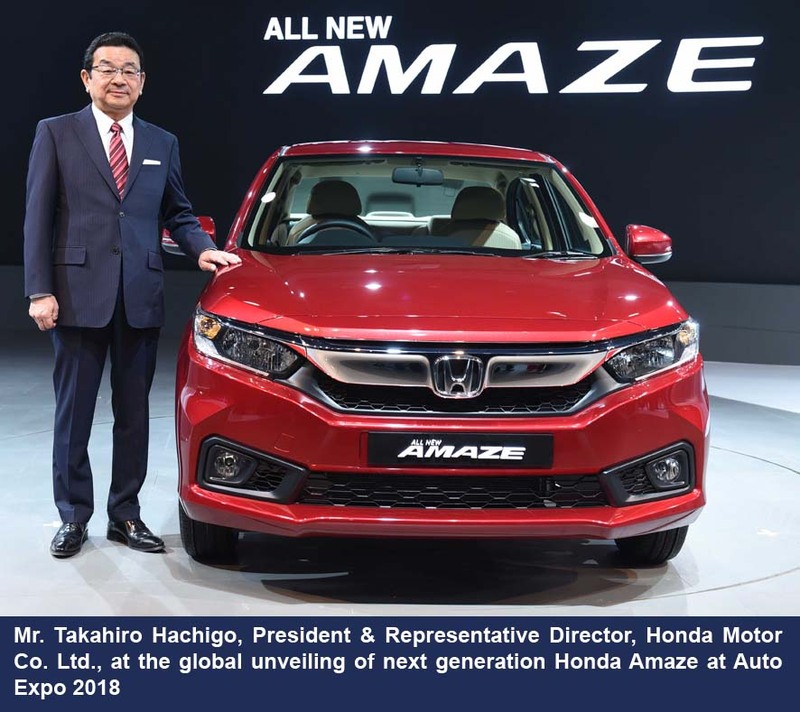 Honda Cars India Ltd. (HCIL), the leading manufacturer of premium cars in India, recently unveiled the Next Generation Honda Amaze at the Auto Expo 2018 in the presence of Mr. Takahiro Hachigo, President & Representative Director, Honda Motor Co. Ltd. This is the World Premiere of the 2nd Generation Honda Amaze and the car is scheduled to be launched in India in FY 2018-19. The 2nd Generation Honda Amaze has all the virtues of One Class Above Premium Sedan with its unmatched bold exterior styling, spacious premium interiors, outstanding driving performance and latest in safety technologies. 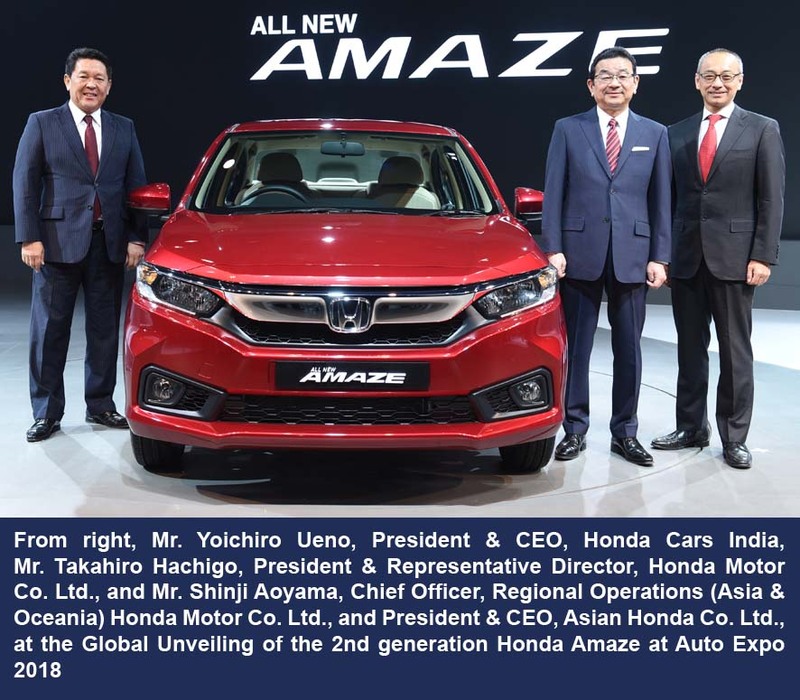 The All-New Amaze has been developed at Honda R&D Asia Pacific Co. Ltd. located in Bangkok, Thailand, following extensive market surveys in India on people’s driving needs and lifestyles. India, being a key strategic market for Honda globally, has been specifically chosen to lead the launch of All New Amaze and will be introduced in the market in FY 2018-19. Building strongly on the previous four generations, the all-new 5th Generation Honda CR-V comes with bold and sophisticated new styling featuring LED headlights and tail lights, LED Daytime Running Lights, a sharp-lined front grille enhancing a stronger look, and new sporty-designed alloy wheels. The all-new CR-V’s interior is an evolutionary design that gives a serene, spacious and comfortable feel. The spacious cabin offers more comfort and is ready to fit all lifestyles with option of third-row seating. With its athletic stance and advanced aerodynamic styling, the 10th Generation Civic sedan boasts a youthful, premium and sporty new style that advances Civic design into the next era. The Interior features high quality materials & design lines that offer a sporty and premium sense including a spacious cabin. The much awaited Civic will be available in both petrol & diesel engine options when launched in India. As a concept model on display, the Honda Sports EV Concept combines EV performance and AI (artificial intelligence) inside a compact body with the aim to realize the joy of driving the user can feel with a sense of unity with the car. The Honda NeuV is an EV concept model that explores the potential of mobility products which will be further expanded by automated driving technologies and Artificial Intelligence. NeuV makes judgements about the driver’s state of stress based on facial expressions and/or tone of voice and provides assistance to the driver to support safe driving, and by learning the driver’s lifestyle and preferences, provides suggestions to the particular driver, realizing communication between driver and mobility. The Clarity Fuel Cell is the pinnacle of Honda’s electrified vehicle technology and highlights the commitment, recently announced by Mr. Takahiro Hachigo that two thirds of global sales will feature an electrified powertrain by 2030. Honda was one of the first automakers to begin focusing attention on hydrogen as a possible solution for issues such as global warming and depletion of fossil fuels. Clarity Fuel Cell is Honda’s most advanced zero emissions vehicle and is the first fuel cell sedan to house the entire stack underneath the bonnet, making the cabin spacious enough to carry five occupants. One of the most fascinating and attractive demonstration at the Honda Pavilion is of the UNI-CUB ß personal mobility device which features the world’s first omni-directional driving wheel system that makes possible the same freedom to move forward, backward, laterally and diagonally that people enjoy when walking by simply shifting the body weight. At Auto Expo 2018, Honda pavilion also showcased Honda SENSING, the new suite of safety and driver-assistive technologies that can help sensing things you might miss while driving. Honda SENSING operates to detect and take action to avoid situations such as one-car accidents, collisions, pedestrian injuries, and missed road signs. Honda SENSING provides safety, while keeping driving fun.